The Student Government Association presidential candidates for next senate’s term were announced at Tuesday’s meeting. In recent years, SGA has only seen two teams run for the presidency. However, this year three teams are in the running. The teams will campaign until the SGA election on Feb. 26 and 27. The running pairs are Kevin Huizenga, a senior musical arts major, and Sidney Juffer, a sophomore accounting major; Matt Yetter, a junior political science, criminal justice and history major, and Dalton Gehle, a sophomore history and English major; and Carson Zubke, a sophomore accounting major, and Hannah Booth, a sophomore political science and criminal justice major. From the three teams, there are four returning senators: Huizenga, Juffer, Yetter and Booth. Zubke was sworn in at the meeting after serving previously as a SGA senator. Gehle is not currently a member of the senate. Josh Sorbe, SGA president, said he is excited to watch three teams run against one another. 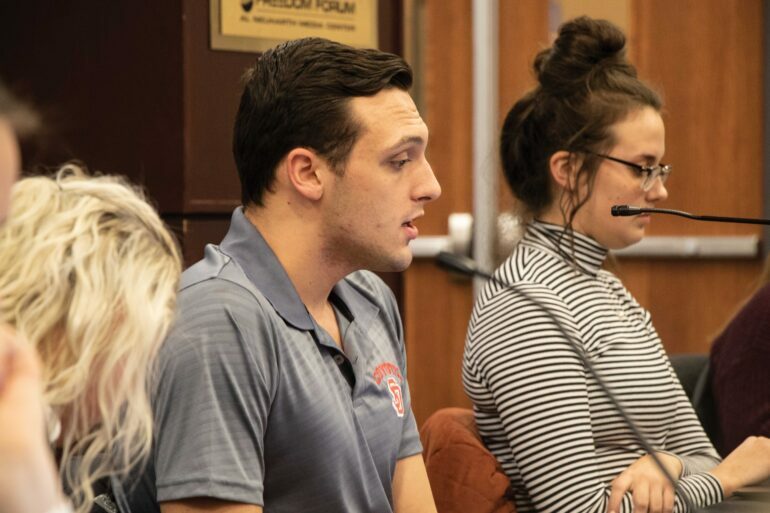 “We haven’t had this for a long time in SGA, and I think having three teams just creates more diversity of ideas and a lot more perspective on what it means to be as student at USD and how we can improve student life,” Sorbe said. Huizenga and Juffer’s goals include acclimating students with a more thorough orientation, increasing involvement in university events, developing improved access to mental health facilities and revamping aspects of the senate to be more approachable. Zubke is running on the pillars “Impact, Cultivate and Empower.” He said he and Booth have a lot of ideas that they’re hoping to roll out in the next couple of weeks. “We really want to increase communication through the student organizations, through the student body,” Zubke said. Yetter does not yet have a slogan, but he said his goals include parking reform and establishing the open electronic resources initiative, which would allow free textbooks for students in general education courses. “I’m running because I think Dalton (Gehle) and I both bring a unique perspective to this, myself being the longest continually serving senator on SGA as well as being the executive director for student federation… (and) Dalton with his involvement in Greek life and the political science league,” Yetter said. Three new senators-at-large were sworn in during the meeting. In addition to Zubke, they are Madi Gillespie and Faith Ireland. Additionally at the meeting, senate resolution nine was passed unanimously. This resolution is a recommendation from SGA to keep the all gender restrooms open in North Complex during Dakota Days.